Digital Combat Simulation (DCS) has announced development of the P-51D Mustang, to be released later this year. Turbine Sound Studios has posted a promotional video from the Boeing 737 CFM56-7B HD Sound Package for FSX. Akesoft has announced development of Reus Airport (LERS) for FSX and FS2004. Details at the Akesoft Website. UK2000 has released East Midlands Airport (EGNX) for FSX and FS2004. Available at UK2000 and SimMarket. The freeware Kata Tjuta (The Olgas) scenery for Orbx FTX Australia is now available at Simviation and OZx. The Avroliner Project has updated the British Aerospace Avro RJ70 for X-Plane 9 and X-Plane 10 to Beta 5. McPhat Studios has released the freeware PMDG 737NGX American Airlines HDTextures. Unlock key in this video. 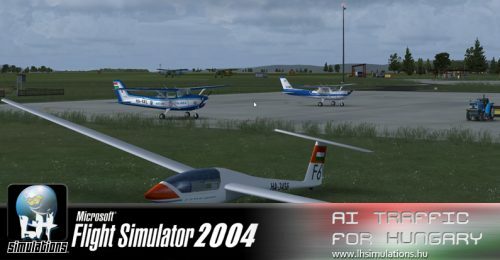 LHSimulations has announced development and posted several preview screenshots from AI Traffic for Hungary. Darren Seare has posted more development renders from the upcoming Eiresim Dublin Airport (EIDW) Version 2. Carenado has revealed development of the Cessna CT182T Skylane G1000 for FSX. Details at the Product Page. GSNext has released French Airbase 101 Toulouse-Francazal (LFBF) and 136 Toul-Rosières (LFSL) for FSX. 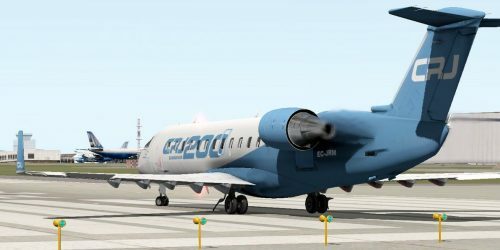 The JRollon Canadair CRJ-200 for X-Plane 9 and X-Plane 10 is now also available to purchase at SimMarket. - Custom simulated systems to mimic the real world aircraft, including a custom FMC! - Real world navigational data supported by Navigraph! - Beautiful custom displays drawn by vectors and with real world simulated pages! - Pop up displays when clicked on the panel! - Immersive lighting effects never seen before in other X-Plane aircraft! - Simulated ice, rain, and condensation! Visually stunning! - Fully interactive 3D cockpit, exterior model, and cabin interior! - Get the realistic airliner experience! JRollon has released update version 1.40 to the Bombardier Canadair CRJ-200 for X-Plane 9 & X-Plane 10. AFS Design has released the Eurofighter Typhoon and Panavia Tornado Royal Airforce Jets Package for FSX and FS2004. Aerosoft has released Maastricht Aachen Airport (EHBK) for FSX. Now Available at the Aerosoft Shop and SimMarket. Alabeo has announced development of the Extra 300S for FSX. First screenshots at the Alabeo Facebook Page. The Sky Simulations McDonnell Douglas MD-10 version 1.5 is now available for both FSX and FS2004. - Re-designed Landing Gear with totally new animations. - Fixed some VC compatibility problems, since MD-11 SP3. - NEW Wings, stabilizers (Super Hi-Def) -NEW Fuselage Textures. - Refined Flight Dynamics with brand new Cargo and Balance. - Cargo Bays has been totally reworked. - Many Textures has been changed to provide better realism. - Fixed Aileron, Rudder and Elevators Shaking problems. - Detailed missing or black textures parts. Dino Cattaneo has posted the first preview picture from the Lockheed Martin F-35A currently under development. Nemeth Designs has released an FDE update and Patch 1.01 to the Aerospatiale AS350 Ecureuil for FSX. - Incorrect rotor blade sounds while engine is shut down. - Multiplayer and shared cockpit problems. Carenado has released service pack 20120118 to the Piper P46T Malibu for FSX. Available at the Carenado Website. - Some issues related to Reality XP integration (Already fixed in the previous service pack). - Operation of some switches and buttons GNS430 and/or GNS530 from Reality XP was installed (Already fixed in the previous service pack). - Fuel pressure gauge (which indicated lower than green arch always). - Small pilot window (which kept its reflections even with window reflections turned off). - Fuel quantity digital and analog readout (didn’t fit together). - Taxi and Landing lights were inverted. Aerosoft has posted the final preview images from the soon to be released Maastricht Aachen Airport (EHBK) for FSX. The freeware Medis Aerodrome (LFCY) for X-Plane is now available to download at the XPFR Website. The freeware Vendays-Montalivet Aerodrome (LFIV) has been updated for X-Plane 10. Download at the XPFR Website. Cami De Bellis has released the new freeware sceneries of Cook Islands and Minas Gerais for X-Plane. The freeware Antonov An-2 version 3.0 has been updated for X-Plane 10. Now available to download at X-Plane.org. Free X-Plane NavData AIRAC 2012.01 is now available to download here. The public beta of Virtual Dispatch Online is now open. Register for your free account at the Virtual Dispatch Website. Khamsin Studio has posted another preview render from the upcoming North American B-25 Mitchell for X-Plane. KC Flight Shop has posted more preview screenshots from the soon to be released Republic RC-3 Seabee for FSX. Just Flight has posted this preview video from the upcoming Aeroplane Heaven Douglas DC-6 for FSX. The Development Team for Zurich X Live has released update version 1.10 to Zurich Airport (LSZH) for FSX. Turbine Sound Studios (TSS) has posted this W.I.P. video from the upcoming Boeing 707 HD Sound Package. Orbx has posted preview screenshots from the upcoming service pack 1 to Ketchikan Intl. Airport (PAKT) for FSX. Skysoft Simulation has released Shijiazhuang Zhengding Intl. Airport (ZBSJ) for FS2004. Available at SimMarket. FlightSim Developers Take 5 Sale with $5 off on select titles for FSX and FS2004. Valid through January 31st 2012.